It's that time of year again: my nonfiction unit is in full effect and I am reading lots of informational texts so I can recommend them to students. I went to a familiar well for this one; students always love A Wicked History books. Typically, all they need is to read one and then they are clamoring for the rest of the series! 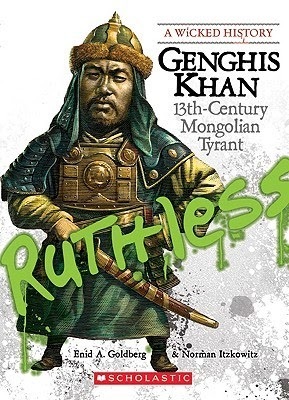 Surprisingly, I haven't reviewed any of the books in this series, although Genghis Khan: 13th Century Mongolian Tyrant isn't my first. I've read about Henry VIII, Ivan the Terrible, Robespierre, Rasputin, Hannibal, and Mary Tudor. These are only a few titles in this gruesome series. I have many male students who became readers because of A Wicked History. All the books follow the same structure. There is an introductory chapter that demonstrates the ruler at their cruelest, then their lives are told chronologically. There are always illustrations and documents, as well as a family tree. The books are really well done and quick reads. I've convinced my school to use their Scholastic credits to add to the collection, because I know that there will be a mad rush for them, once the students get a taste.